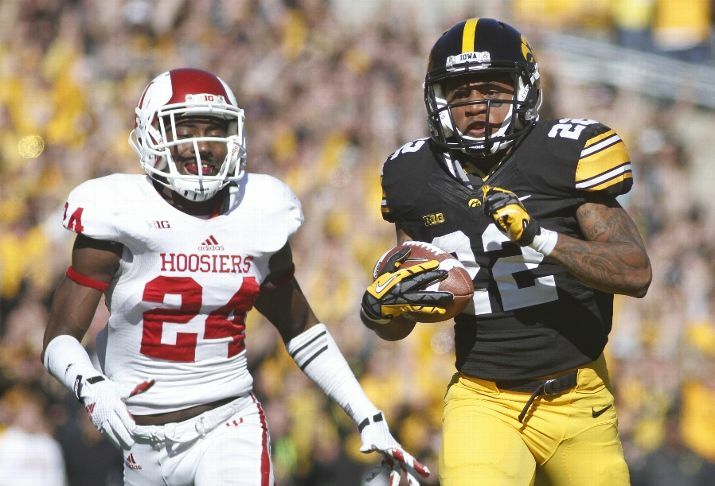 Coming into Saturday’s game versus Indiana, Iowa had only managed to score more than 24 points once and that was in the season opener against Northern Iowa when they won 31-23. Against Indiana, they scored 28 points by the end of the first quarter. The Hawkeyes won 45-29. Neither team scored on their first possession, but Iowa used a methodical drive on their second series to take the lead. Jake Rudock hit Jake Duzey on a 12 yard pass to make it 7-0. The defense got in on the act when Desmond King double the lead at 14-0 with his 35 yard pick six. After forcing a three and out, Iowa took one play to get back on the board. Rudock hit Damond Powell for a 72 yard touchdown and the rout appeared to be on. That was delayed for the time being when Tevin Coleman off an 83 yard touchdown run to cut the lead to 21-7 for the Hawkeyes. Once again, it took just a single play for Iowa to score. Jonathan Parker broke off a 60 yard run of his own to restore a 21 point lead at 28-7. Indiana came right back with a touchdown. Nate Sudfeld connected with Shane Wynn for 62 yards to the Iowa 24 yard line. Sudfeld would connect with Nick Stoner for a 13 yard score. Two drives later, Tevin Coleman ran for a 45 yard touchdown and it was 28-21. Iowa added a 22 yard field goal from Marshall Koehn before taking a gamble with 3 seconds left in the first half. Kirk Ferentz decided to go for it on fourth and goal from one yard line. Mark Weisman pounded his way in to make it 38-21 at the break. The third quarter saw no scoring as both defense stiffened. Iowa added another one yard touchdown from Weisman early in the fourth quarter to extend the lead to 45-21. Tevin Coleman broke off his third long touchdown run of the game on the next drive when he ran in for a 69 yard score to make it 45-29 after the two point conversion was converted. It was an amazing performance by Coleman who continues to have a superb season. Coleman ran for 219 yards and 3 touchdowns on 15 carries. He has ran for at least 122 yards and one touchdown in EVERY game this season. For the season, he has 120 carries for 1,060 yards and 11 touchdowns. Nate Sudfeld went 4 of 9 for 85 yards with a touchdown an interception. Shane Wynn was the top receiver on his lone catch for 62 yards. Jake Rudock went 19 of 27 for 210 yards and a touchdown. Mark Weisman carried the ball 25 times for 89 yards and 2 touchdowns. Damond Powell was the top receiver at 3 catches for 85 yards and a touchdown. Tevaun Smith caught 4 passes for 69 yards as well. Indiana (3-3, 0-2) has alternated wins and losses to start the season. If they continue that trend, it would be a great upset next week at home against Michigan State (5-1, 2-0). Iowa (5-1, 2-0) continued their strong start to the season and are in prime position to win the Big Ten West. They travel to Maryland (4-2, 1-1) next week in what should be a good matchup.